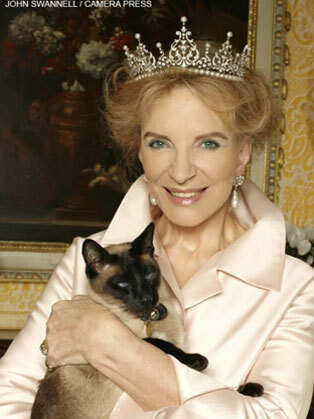 Her Royal Highness Princess Michael of Kent is the younger child of the late Baron Gunther von Reibnitz and his wife, the late Marianne, née Countess Szapary. She was born near Carlsbad in Bohemia on the estate of her maternal grandmother Princess Hedwig zu Windisch - Graetz, and descends from ancient European lineage on both sides of her Family. Having lived in Austria, Australia and on her father’s farm in Mozambique, the Princess moved to London from Vienna to continue her historical studies, including the History of Fine and Decorative Artat the V&A, and subsequently formed her own interior design company, Szapar Designs. She married His Royal Highness Prince Michael of Kent, the first cousin of Her Majesty Queen Elizabeth II, in Vienna in 1978 and they have two children, Lord Frederick Windsor and Lady Gabriella Windsor. Their Royal Highnesses undertake over 200 public and charitable engagements annually as royal Patrons or Presidents for more than 100 charities and other not-for-profit organisations, which they support independently. Both speak a number of languages and are active in several different sectors and countries which reflect their interests, not least in Russia, they also support the promotion of British business and exports overseas. Princess Michael has taken on a number of new commissions for lectures and decorating and has joined Gmurzynska Galerie in Zurich as their International Ambassador. The Gallery specializes in Contemporary and Modern Art as well as Impressionists and the Russian Avant Garde. Princess Michael’s fourth book and her first historical novel, “The Queen of Four Kingdoms”, set in 15th century France, is Volume I of The Anjou Trilogy. This first volume will be available in bookshops from 17th October, and on Amazon and other on-line outlets. Volume II, "The Mystery of Agnès Sorel" will be published in 2014 and the third volume, yet to receive its definitive title, is expected in 2015. It was the success of her first book that stimulated international interest in Princess Michael to give lectures on her specialist subjects, initially speaking to the French Institute in New York City which led to her long association speaking for the Metropolitan Museum and for Sotheby’s in USA. For the past twenty years she has pursued an active lecture career, speaking on various historical subjects. Her Royal Highness has spoken all over the U.S., principally at museums and universities but also for banks and other commercial institutions. Princess Michael has also lectured in other countries including Canada, Argentina, Greece, Austria, Switzerland and Russia, both commercially and for a variety of charities and national institutions, most often at museums, universities and galleries. Her Royal Highness served on the Board of the Victoria and Albert Museum. Princess Michael’s other love is for her animals - in particular horses, dogs and her Siamese and Burmese cats of which she is particularly fond. She is the Royal Patron of three animal conservation organizations in Africa, which are respectively concerned with cheetah in South Africa, rhino and wild dogs in Tanzania and an elephant and rhino orphanage in Kenya. Another passion is Her Royal Highness’ garden. She has a number of lectures in her repertoire on the history of the garden and is an Honorary Freeman of the Worshipful Company of Gardeners, a City of London Livery Company. Princess Michael is also Honorary Freeman of two other livery companies: the Worshipful Company of Weavers and the Worshipful Company of Goldsmiths. HRH was awarded the Order of the Starry Cross, the ladies' equivalent of the Order of the Golden Fleece, by Her Imperial Highness the Archduchess Regina of Austria who died in 2010. The Princess is also a Grand Dame of the Order of Malta, and in September 2010 received the Order of Mercy in recognition of her 32 years charity work.